There are many COPD symptoms that can be attributed to other diseases such as asthma, pneumonia and other less serious lung conditions. But it must be really important to know how to differentiate Chronic Obstructive Pulmonary Disorder from these, since it’s serious and often irreversible. An early diagnosis of COPD will lead to an easier treatment and the preservation of efficient lung function. 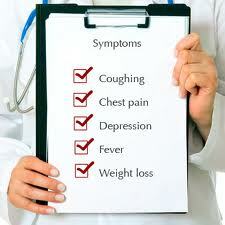 This is the most common symptom of COPD. Dypsnea is a medical term to indicate shortness of breath, which can be usually characterized by the feeling of using more effort in breathing, or a gasping, difficult, or labored breaths. In its inception, Dyspnea will only be experienced whenever the person is subjected to physical exertion, hence making them think that it was only tiredness. As the disease advances, this symptom may be experienced even while resting, making it the most debilitating and anxiety-inducing symptom of COPD. In COPD, chronic coughing is prominent and persistent, but at the same time most ignored, since it’s usually attributed to the environment and often mistaken as common colds or other related illnesses like chest infection. Chronic cough could either be productive, which produces mucus, or non-productive, which produces no mucus at all. At an early stage, chronic coughing may only occur irregularly, but as it progresses, it becomes more steady and may span the entire day. Another common of the common COPD symptoms, wheezing is characterized by a whistling sound heard during the breathing cycle, which could be a sign of the narrowing/blocking of the air passages. In some cases, other abnormal sounds are produced in addition to the whistling sound, but it can only be detected with the use of a stethoscope. Tightness of the chest, in turn, makes automatic breathing an effort due to the feeling of pressure within the chest cavity, which can also be a symptom for minor lung infections. Having a tight chest can make deep breathing painful, which ultimately results in breathing short and shallow. Though of course, these two may be absent, but they still count as COPD symptoms. Commonly called phlegm or mucus, patients afflicted by COPD often produce small amounts of sputum whenever they cough, as compared to those afflicted by other lung diseases, where the amount can be copius and commonly thick, which can make COPD even worse. If a bacterial infection develops, the consistency and hue of the sputum is subject to change. Often, fatigue is mistaken as common tiredness, making it the most underreported of the COPD symptoms, since most people find it difficult to differentiate the two. Besides, most people only recognize Dyspnea and chronic coughing as the defining symptoms and therefore neglect fatigue. But it must be known that fatigue is 3 times more likely to be present in people with lung disorders than their healthy counterparts, so it must also be considered. Weight loss and Anorexia come in when the case of COPD has reached its severity, often resulting in malnutrition if left unchecked, which could seriously damage other body functions and may lead to life-threatening conditions. These COPD symptoms must also be investigated further, since it can also be an indication of other illnesses, like lung cancer and tuberculosis. These emotional COPD symptoms are often overlooked, but are considered clinically relevant, since it may result in the worsening of COPD and an overall deterioration of the person’s health. Anti-depressants or other non-pharmacological treatment can be utilized to curtail or even eliminate this condition sometimes, so if either symptom is experienced, it’s best to consult a specialist about applicable treatments. As stated by the Global Initiative for Obstructive Lung Disease, the primary Symptoms of Chronic Obstructive Pulmonary Disorder is Dyspnea, followed by Chronic coughing and sputum production, but the latter two may be present even before Dyspnea develops. On the other side of the line, Dyspnea may be present even without the development of chronic coughing or the presence of sputum. The risk of developing COPD may be linked to a history of exposure to the various risk factors in prolonged intervals or may even be hereditary, so it’s important to have a regular check-up with specialists in order to diagnose whether that simple cough or that wheezing sound is COPD or other common illnesses attributed to these symptoms. Explaining the main differences between COPD vs Asthma. Symptoms may appear similar but there are ways of knowing which one you have and what can be done about it.